One of the issues with Iconographer's UI in its current iteration is that it requires a lot scrolling to get from member to member (screenshot). With monitor aspect rations tending to the wider side lately, it makes sense to take advantage of extra horizontal space. Therefore, as an alternative in Iconographer 2.6, I'd like to have a members palette that looks something like the one to the right (thanks go to Microsoft Word and OmniGraffle for inspiration). The palette is then twice as wide as it normally is, and so the preview and color ones can be put side by side underneath (since they're of unequal length - though I may tweak that too). I don't have enough room for the 4-bit member (in the Huge variety). Since support for them is deprecated anyway, it may not matter at all. 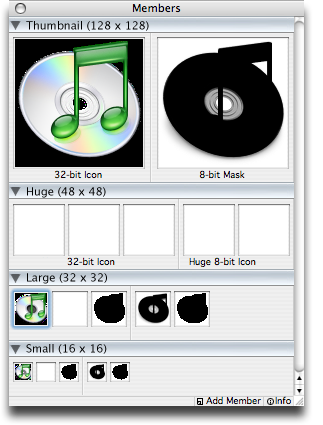 I am considering dropping support for pre Mac OS 8.5 icons altogether in fact. I'm still not sure how to label the different icon and mask depths. I can use mini icons (Icon Machine style), or some kind of clunky label (e.g. "32/8/1-bit icon") for each grouping. How will this mode be activated? Is can be just a matter of resizing the window to be wider (but since intermediate values won't be allowed, how will it occur to the user to do that in the first place?). Or it can be another option in the preferences, along with the current "Display Scaled" setting. However, I have a feeling that's also not very discoverable. The super-tiny "Add Member" and "Info" buttons are bugging me more than ever (though they also have key shortcuts and menu items). I may have to go back to using normal sized scrollbars, which would let me have regular sized grow-boxes, which in turn lets me make those buttons 16 pixel tall, better than the current 11.